I can discuss acceptable uses of technology. I can discuss unacceptable uses of technology. I can give examples of acceptable and unaccceptable social networking. I can give examples of acceptable and unacceptable text messaging. I can give examples of cyber bullying and why it is wrong. I can give examples of plagarism and why it is wrong. Can you get your online reputation tree to grow 80% ? When you do, try to get 80% or better on Betty's Netiquette Quiz. Make your best effort. Good luck! 1. 5th Graders, look for examples of acceptable and unacceptable social networking in this video clip. 2. Practice sending a simple email to a partner. 3. Practice sending a simple email to your team of 4. 1. Practice sending an attachment. 2. Practice sending a link to an educational website. Students make choices about what to do if they or their friends are cyberbullied. 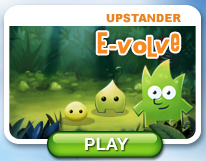 They are encouraged to "evolve" into an “Upstander” – someone who takes action to stop cyberbullying, rather than standing by. interpret scenarios that illustrate how targets of cyberbullying feel. identify ways to be an “Upstander” when cyberbullying occurs.